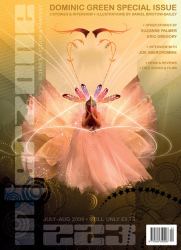 Interzone issue 224, published on September 10th, contains a novella by Jason Sanford plus short stories by Katherine Sparrow & Rachel Swirsky, Jeremiah Tolbert, Adrian Joyce, and Chris Butler. Cover art is by Adam Tredowski and interior art by Paul Drummond, Dave Senecal, Mark Pexton, and Martin Bland. All the usual news, reviews and give-aways are here, and the books section includes Robert Holdstock on 25 years of Mythago Wood. We have sent a substantial number (relatively speaking) of copies of this issue for overseas distribution. I can’t yet give a breakdown of where these copies are going, or what the cover price might be, but presumably the majority are going to the USA. 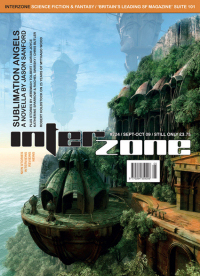 If you’re already an Interzone reader please help spread the word that the magazine can now be bought in shops overseas. If you’re not yet a reader and you see the magazine in a shop, please buy it! This is a test issue but it’s hopefully something we can build on. 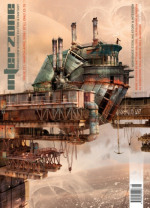 Interzone has recently published its 223rd issue, making it the longest-running British science fiction magazine (if counted by issues). The previous record-holder was New Worlds, which ran to 222 issues. British Fantasy Award, Hugo Award, a great many awards and reprints for individual contents. Information provided by Andy Cox.